The Miniature Schnauzer is susceptible to liver disease, kidney stones, skin disorders, cysts and eye problems. It is important that when contacting a Miniature Schnauzer breeder that you express health concern issues and ask the breeder what they are doing in order to help mimimize them. Please don't purchase your Miniature Schnauzer from a petstore which commonly are known to support Miniature Schnauzer puppy mills. Doing so only promotes inproper breeding ethics and promotes current Miniature Schnauzer health issues. 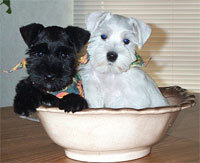 The registries recognize the Miniature Schnauzer breed standard. Temperment: This dog gets along well with children, other dogs, and any household pets. Strangers will be announced with loud barking. Care Hair around the face should be combed regularly to avoid tangles. Excessive hair around the pads of the feet must be trimmed. The coat needs to be plucked by hand twice a year. It must never be clipped.